I was watching Food Network last weekend and saw The Best Thing I Ever Made. Sam Choy made this recipe and I thought it looked tropical and yummy. I whipped it up yesterday and we enjoyed it this Thanksgiving Eve for dessert. Everyone seemed to enjoy it. They all said it would probably taste pretty good with pineapple as well. This recipe has a couple steps so it was an all day project with my 11 month son crawling around and getting into everything! It had to set overnight so that was nice to have dessert all done and ready to go the next day. For the crust: Preheat the oven to 350 degrees F. Sift the flour into a bowl. Add the nuts and mix together. Cut the butter into cubes and add it to the bowl. Using your hands, incorporate the butter into the flour and nuts. Then, press it into a 9×13 inch pan. Bake for 20 to 25 minutes. Allow the crust to cool to room temperature before adding the cream cheese filling. For the filling: Add the heavy cream, sugar and vanilla to the bowl of a stand mixer fitted with the whisk attachment. Start mixing on low, and then turn to high speed and mix until it forms stiff peaks. Set aside in a bowl. Switch to the paddle attachment on your stand mixer. Add the cream cheese and beat until smooth, starting on low speed and increasing to high. Then, add the whipped cream to the bowl with the cream cheese and stir to incorporate. Spread it over the cooled crust and refrigerate for 1 hour. For the topping: Sprinkle the gelatin into a bowl with 1 cup cold water. Whisk to dissolve the gelatin. Then add the boiling water, sugar and salt. Stir until the sugar is dissolved. Add the lemon juice and stir to combine. 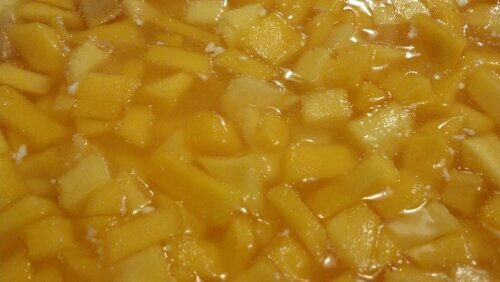 Then add the mangos and chill for a few minutes until the gelatin begins to set. 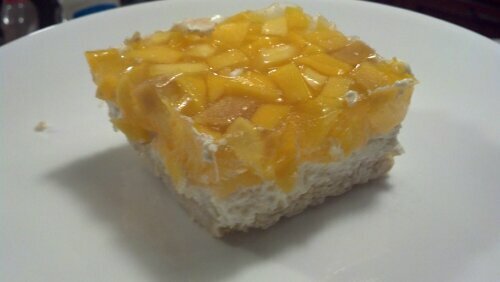 Pour the mango topping over the cream cheese and refrigerate until firm, about 2 hours.